Poor Mojo's Classic Squid: Squid "Ask the Giant Squid: To Knit, Perchance to Dream; Aye, There's the Rub"
Hi. I am writing to ask a question about a knitting pattern that was posted, Squid #232. Well, my brother asked me to knit this for him and his 30th birthday is coming up, so I wanted to make it for him. Being that he is obviously not a baby, I was wondering if you had any suggestions on adapting the pattern to an adult. Thanks so much for any info you might have! Oh mighty squid, could you pass this missive along to your loyal subject and author of the cutest squid hat pattern in the universe, Sara Swanson? Salutations, Squidly Subject Sarah Swanson. Alliteration aside—I couldn't stop laughing as I scrolled down the photo page. It was truly inspired. Utterly hilarious. If you write anywhere else, I'd love to read it. But on a more mundane matter, I'm trying to knit that hat for myself. I have a much larger cranium, nearly 24 inches around (It is a pretty big noggin) and my knitting skillz (such as they are) don't extend to pattern manipulation. The last time I tried that, I ended up with a hat the size of a pumpkin. Can you help? (Jeeze, I'm nervous) Um . . . Giant Squid? I'm attempting to contact you with hopes you will respond. I don't know if you'd even care to, but if you do, I would be so grateful! Anyway, this is regarding that knitted squid infant hat. I think that hat is so cute! What I was hoping is if you could, by any chance, make some instructions for a bigger version; one to fit an adult (in other words, me). Today, I am proud to announce that finally, finally, we are well prepared to sate the hunger of those many, many stitchwomen looking to knit a net of architeuthic splendor to ensconce and ensorcle the heads of the very important adults in their lives (including, but not limited to, themselves). I wish you and your needles Dark and Elder Godspeed in this endeavor. Should you knit a hat, and should you choose to photograph it digitally, I would be plainly delighted to feature such photos here on my Almanac(k), and her associated Newswire weblog. At this point slide the rest of the stitches onto a circular needle or a really big paper clip, or anything that will hold the stitches. You are leaving these alone for now. Ignore them. After you have run out of stitches and have a nice pointy triangle, slide the stitches you were holding with a paperclip (or whatever), onto your needle and follow directions for rows 41-127. Starting from the edge of the body that does not have a long tentacle, count in 5 stitches and up 17 stitches. Here slide your knitting needle through one side of 15 stitches. It should look like you've cast on 15 stitches. Be sure you are holding the knitting so that the pointy head is towards you and the pointy tentacles are pointing away from you. Row 26: Should be a single stitch. Pull out loop so you have enough yarn to tie a knot. Tie a knot and cut the yarn. Count 5 more stitches over and repeat for three more short tentacles. The 4th one should end 5 stitches away from the long tentacle. On the other side of the long tentacle count 5 stitches over and begin again for another four short tentacles. Do the same as you did for the long white tentacles. Rows 54-76: Continue following this pattern until you have only 12 stitches left on your needle. Cut your yarn leaving a good 8 inches. Thread it onto a yarn needle (or use a crochet hook) and pick up each stitch with it. Pull tight so you have a small circle. Tie yarn in a knot and cut excess. Do the same thing that you did for the white short tentacles, but pick the row of stitches one row under the row you started with before, and be sure that this time the pointy head is pointing away from you as you knit and the pointy tentacles are pointing towards you. Only knit up 16 rows before you begin to decrease. Either using a yarn needle or crochet hook, use white yarn to sew the parts of the hat together. It's easier to do all of the sewing wrong side out, except the seam on the blue interior, then flip it all right side out and sew that up. Be sure that all of the knots and ends of yarn are on the inside and don't show. If the tentacle and pointy head aren't flat enough, you can get two towels damp, lay the parts between the two towels and iron on high. Pick two buttons and sew them on. To be more accurate, sew them on each side. To make the squid more friendly looking, sew them near the sides, but both on the front. If you deem to contact us with questions regarding this hat, please be sure to include an EMAIL ADDRESS so that we may reply to you directly. 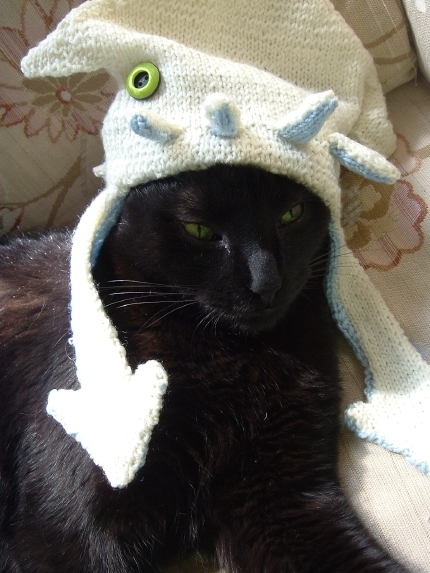 See also: Visions of the Giant Squid: To Eat a Cat (also, with instructions for knitting a squid hat for your infant). If you like squids and textiles, you might also like sewing a Sock Squid; instructions available as a free download from David Erik Nelson's DIY craft book Snip, Burn, Solder, Shred.